Quix trains your reaction time and visual perception. Move like-colored blocks together vertically to score points and clear blocks from the board. To begin, click the Small, Medium, or Large link or PLAY GAME button under the picture of the game at left. This opens the game in a pop-up window. After the game loads, click the "PLAY" button in the middle of the game. 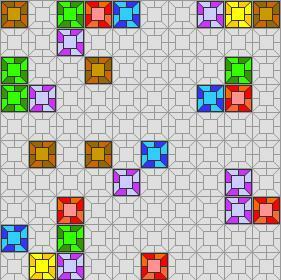 Various colored blocks continually appear on the board in a random fashion. You need to remove these blocks as quickly as possible, before the board fills up. HOW TO PLAY. To remove blocks, move individual blocks together vertically (where one block is above or below the other). To move a block, click the block once to select it. Then click the square where you want the block to move. New blocks continually appear on the board, so you need to be fast. One way to clear blocks more quickly is to remove three blocks at a time. To remove three blocks, look for two matching blocks aligned vertically one above the other with an empty space between them. Move a like-colored block into that empty space to complete the trio and remove the blocks. Game distributed by y3.com. Used with Permission.